This little guy is Scotty, a.k.a. 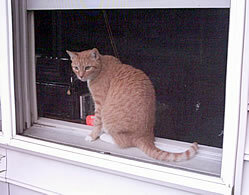 "Mr. Scott" (like the "Star Trek" character), and he is the furry youngest "child" of DQ Times staffer Carolyn Williams. Carolyn and family got Scotty a year ago from a friend who works with an animal rescue organziation. Now aged 2 1/2, Scotty is an affectionate orange tabby whose favorite pastime (besides eating, sleeping, playing and sitting in windows on nice days) is curling up in someone's lap--usually Carolyn's. 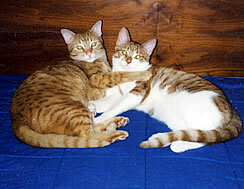 This is a photo of Murphy( bottom ) and Samantha (top) of photo. Murphy is 11, and Sam is 5. Both are rescued dogs. Sam is afraid of men and many things from her past life, she depends on Murphy a lot. Both are sweatharts, really precious doggies. Photo by Patty Holland. 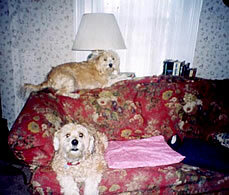 Dogs Murphy and Samantha Holland. 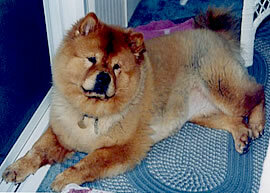 This is Mrs. Bosley Chow Chow. She is 8 years old, and a sweet little gal. She is a light in my light and we have many fun times together. She is gentle and fun to be around, she is smart and full of zest. She makes my life and days happy. I am very lucky and honored to have her in my life,I am blessed. 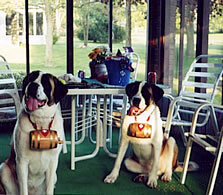 Photo of Saint Bernard siblings Saddie and Ivy. Now 4 years old. 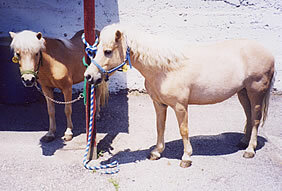 These are my pride and joy, my two Shetland Ponies. For as long as I can remember, I've loved horses, and wanted one of my own. My dream finally came true when I was 14. Tinker Bell, who is almost 17, is the one in the green halter. Pixie Dust, who is 14, is the one in the blue halter. They are full sisters, They live at a nearby farm.